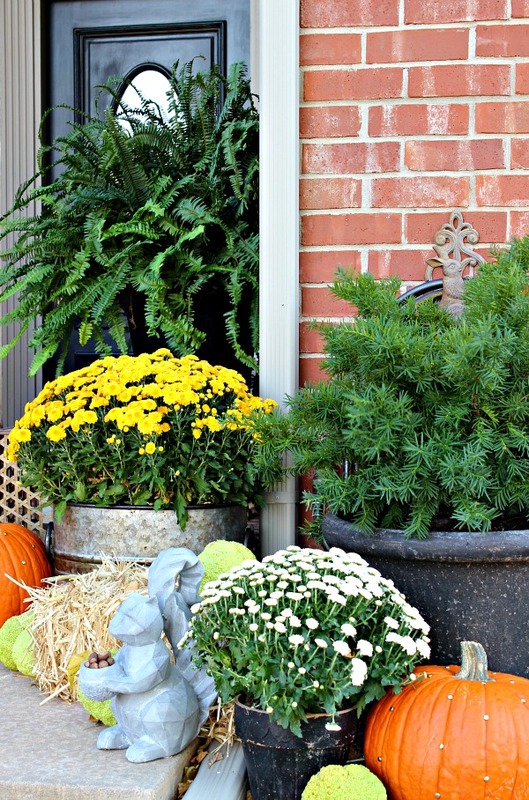 I've shared my Fall decorations around the house and on the patio with you all, but I'm just now getting around to decking the front porch out for the season. 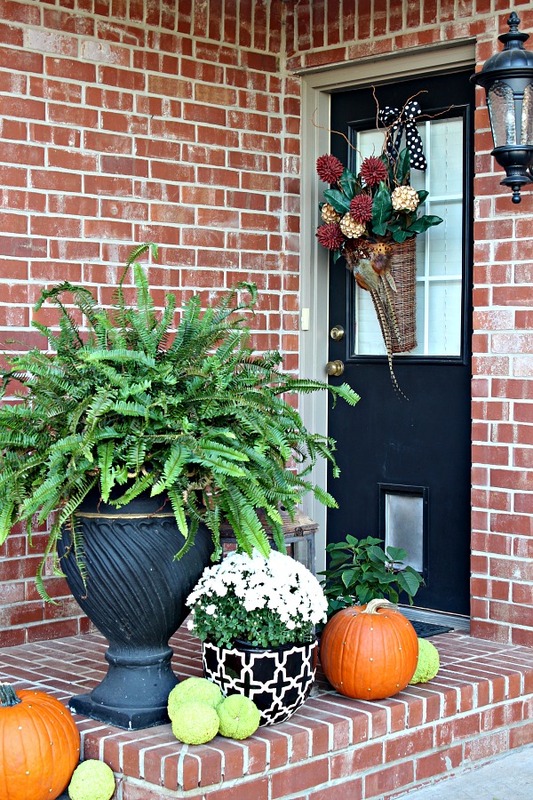 Although I've decorated inside the house without a single orange pumpkin, I like to keep the porch pretty traditional for this season. Even though I knew the direction I was headed, I needed a few things to mix with the pieces I already had to freshen things up. At Home Stores had everything I wanted to spruce up the porch and create a warm welcome to our home for friends and guests. 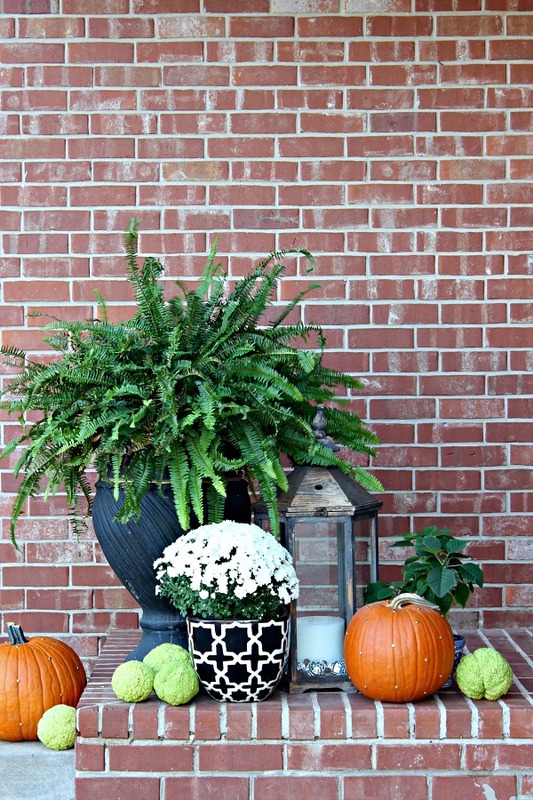 My ferns from the summer were still going strong (ombre, even! ), so they stayed in place for a pretty backdrop and added color and texture. 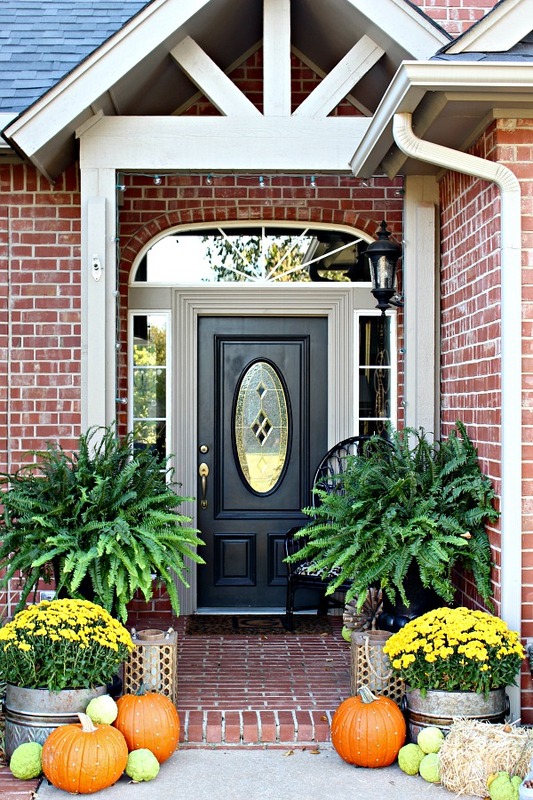 There's nothing I like better for a pop of Fall color than yellow mums, and two large ones flank the porch. A nice variation from a typical pot or urn, this galvanized planter has a pretty texture stamped in the lower portion, and that strip of bronze around the middle made my heart skip a beat! I also appreciated the detail of the chunky ring handles on the sides. I knew that I wanted a new pair of lanterns for the porch, and I'm sure that At Home has the largest selection and variety of styles of anyone in town. One thing I DON'T like about using lanterns outside is how quickly the glass gets dirty, so I purposely looked for something a little different. When I saw these bamboo woven lanterns, I knew they were perfect! The sides are totally open and a glass tube sits down in the middle to slip a candle or tea light in, and no glass sides to worry about keeping clean! The design that mimics caning won me over fast, too, and the cute rope handle is a nice touch. If you've been a reader through previous Falls, you know that I always scavenge around area trees to pick up some osage apples... horse apples... hedge apples... those bright green balls. Seems like everyone has a different name for them! 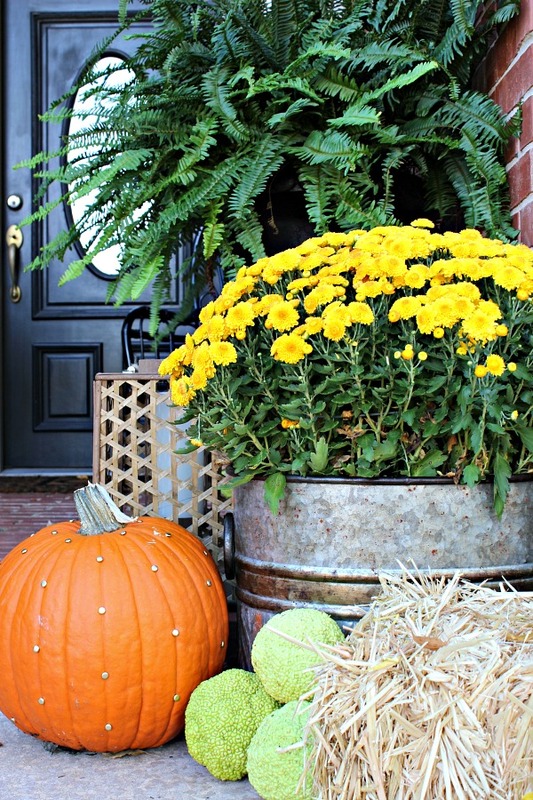 Years ago, I used to pick up a hay bale to use in my outdoor Fall Decor. But, those things are HEAVY, and a little too large to fit in on the porch. I was delighted to find a variety of straw bale sizes in At Home (remember the mini ones I used on my Fall Harvest table?). 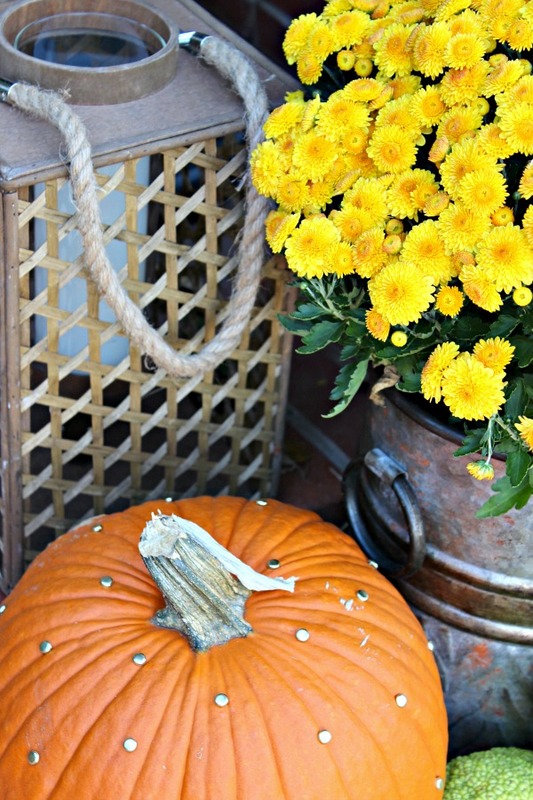 This medium straw bale was just right to tuck among the mums and pumpkins. 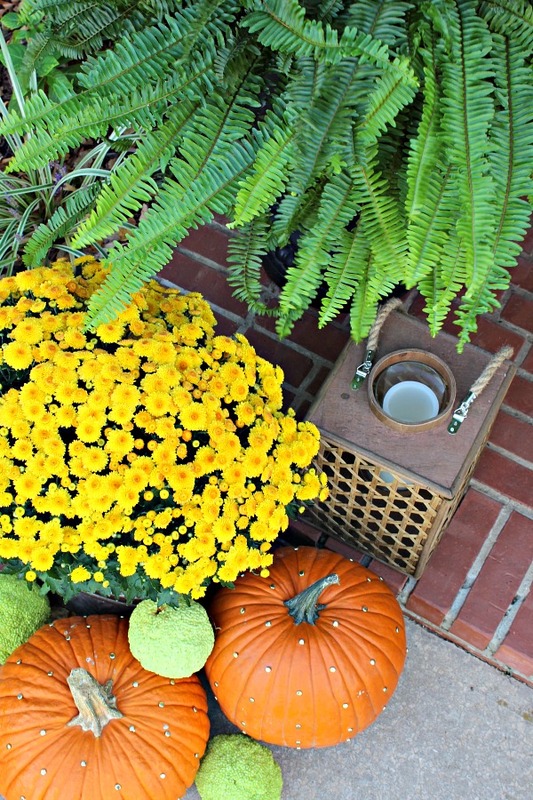 Did you see our little squirrel friend found his way to the front porch from my Fall table centerpiece, too? I think I'm going to like having him around. 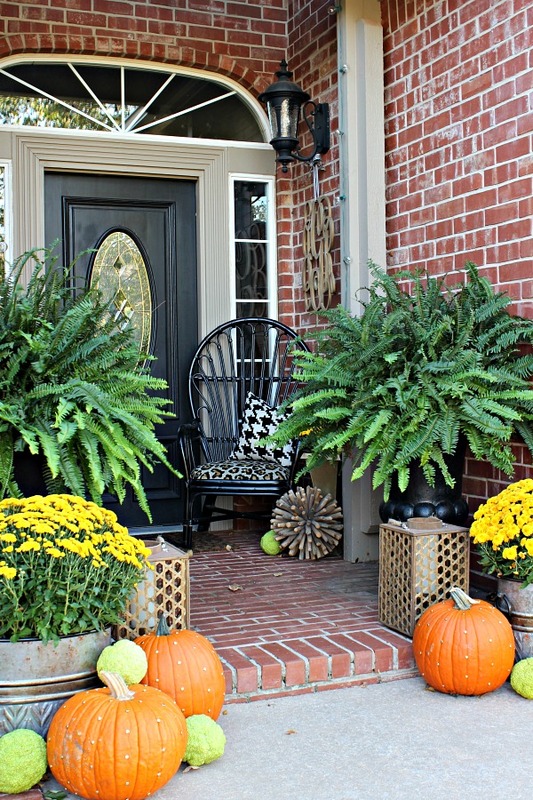 I love a little sitting area on front porches, and although we don't have a lot of room on ours, I tucked a chair next to the front door. 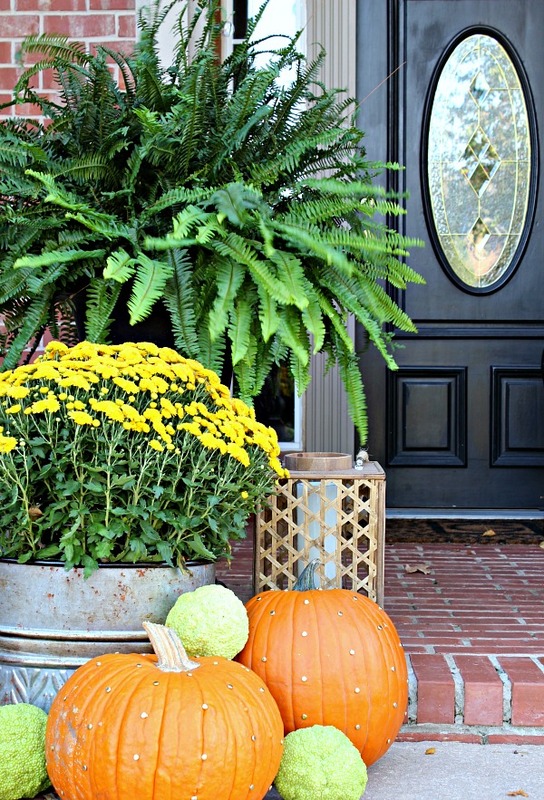 Our side porch got a little bit of love for Fall, also. The black and white pot is old, but I've seen an almost identical one at At Home. At Home has a nice selection of faux florals, and I couldn't resist these spiky reddish ball stems that were with the Fall decor. 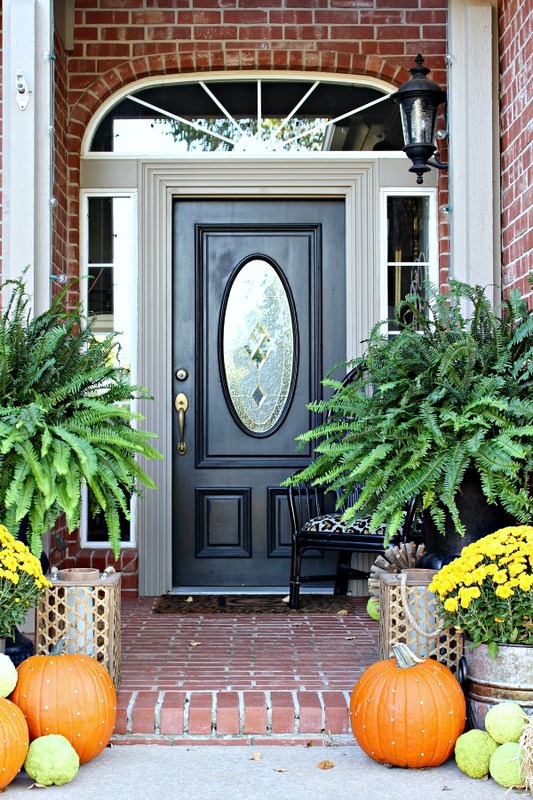 I combined them with some others I had on hand to decorate the side door. The pheasant was a gift from a neighbor, and the colors in the feathers are just captivating. And remember the poinsettia I mentioned earlier this week? That's it behind the pumpkin on the right, I hope I remember to bring it in before the first freeze! 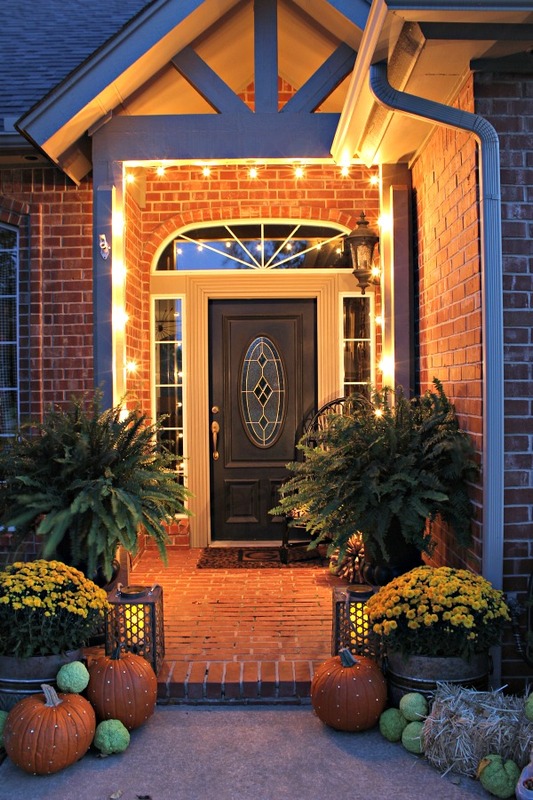 One more thing that I saw in the store and couldn't resist using on the porch- these white globe lights! Who says outdoor lights are just for Christmas? 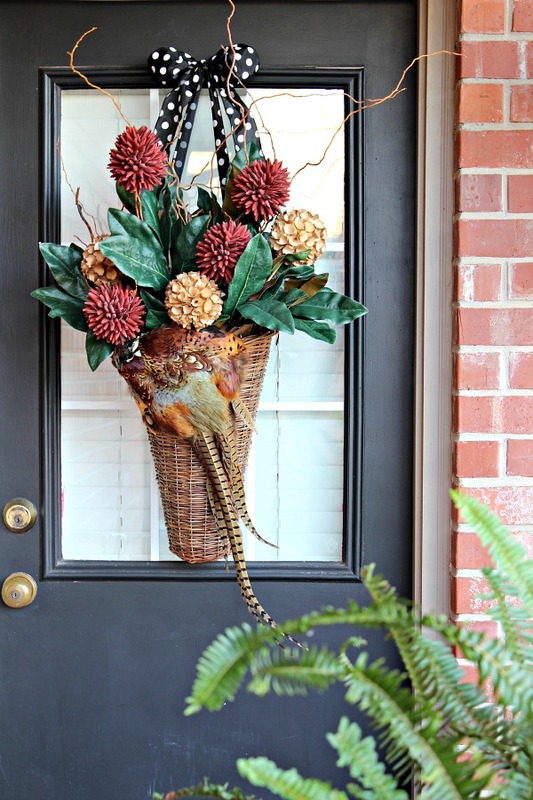 I wanted to add a little ambiance to the front door, and they're just right. I tried stringing them back and forth zig-zagged across the top, but it wasn't looking right so I just framed the posts with them. There are some cup hooks across the top that I use at Christmas, and I used a few staples down each side to secure the wire to the post. This LED candle was just right inside the lanterns. And it might just be my new favorite thing! I'm pretty excited about it... it's battery operated, which is not a new idea, but it also has a TIMER! I know that's probably not a new idea, either, but it's the first time I've had one like this and I'm wondering what on earth took me so long! When the switch on the bottom is set to "Timer," the candle stays on for 6 hours, then shuts off. THEN IT COMES BACK ON THE NEXT NIGHT, automatically, at the same time it was turned on the first night. I'm telling you, this is revolutionary! And, like I said, I'm probably the last person on earth to discover this magnificent invention. ;) No more fire hazards by using a real candle or remembering to "light" the candle when it gets dark, it lights up by itself. Genius. 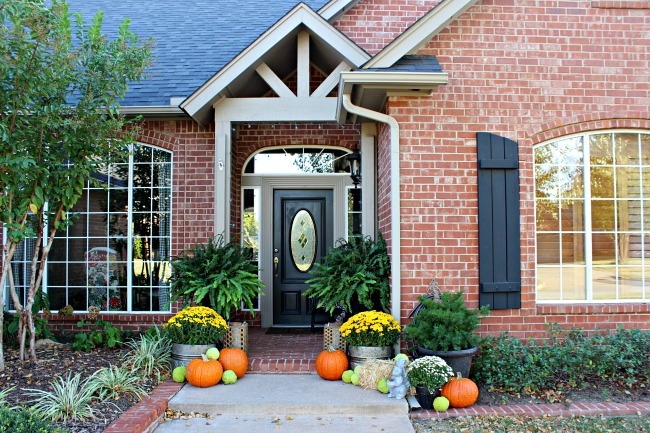 Alright, NOW it feels like Fall at our house!! 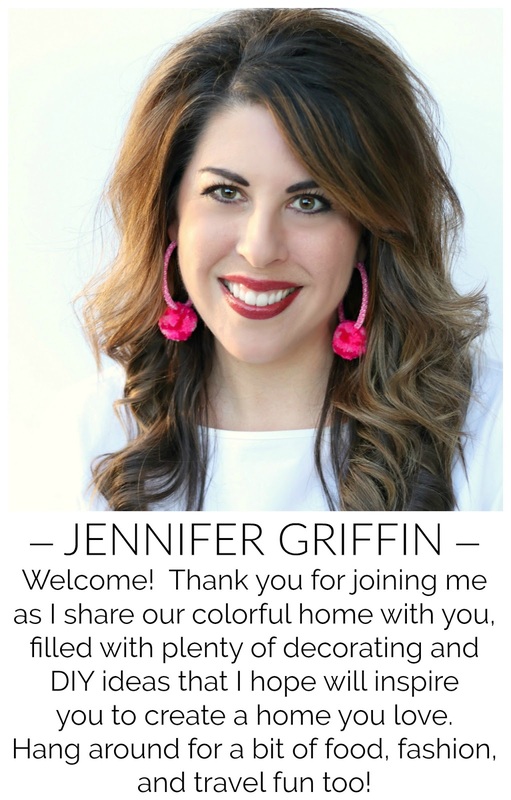 I have partnered with At Home as a member of the At Home Inspiration Team for this sponsored post and am happy to share some of my favorite products provided for me with you! All opinions are mine alone. One more thing, I'm honored to be featured over at Dixie Delights today! If you don't know Amanda, you MUST head over. Right now. Especially if you love southern charm and traditions, Lilly Pulitzer, festive holiday decor, Disney, fun ideas for kids, recipe ideas, and great trip suggestions (and she has a cute Etsy shop, too!). I was highly inspired by her screened in porch as we designed our patio, and I totally copied her darling black and white spotted chandelier shades. Pop by and say hi to Amanda today! this is soooo pretty! i don't know if we have that variety of those hedge apples here, but we have something similar... and i sprained my ankle on one last year right after my running partner tripped on one. so we have a name for them.... ninja nuts. Wow, it's beautiful! 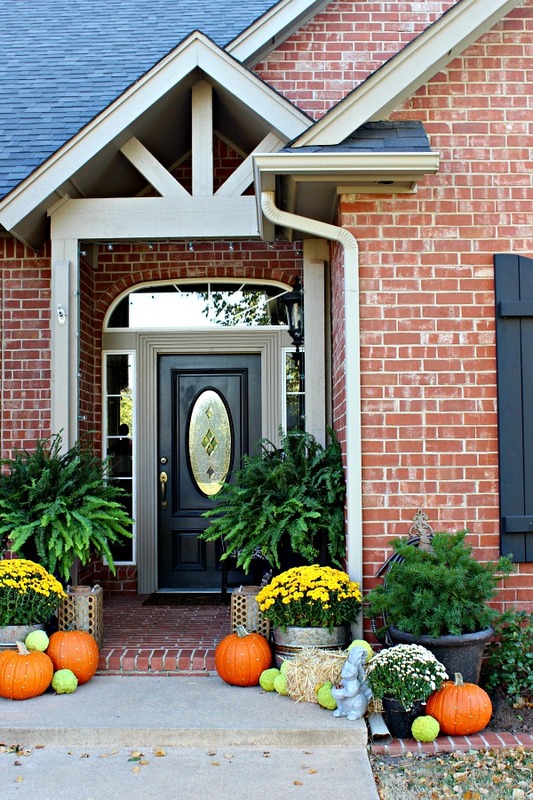 I love every aspect of your decorations. And aren't mums just amazing? I would love for you to catch a shot of a squirrel sitting on his haunches face to face with the concrete squirrel...eating out of his little basket of readily available acorns. 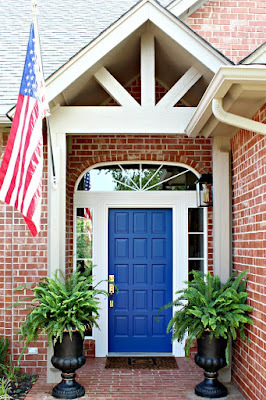 I love your porch, it looks great! I found some small hay bales at JoAnn's this year and they're the best for decorating with. It's really beautiful. I am speechless. I never see this type of home decoration before. Fallen in love with your home. Just Beautiful! Jennifer, thank you for the inspiration (especially the studied pumpkins). You are amazing! Can't wait to have a At Home store somewhere near by. It’s so pretty! Thanks for the straw bale tip, we got full sized ones last year and my husband said never again! HEAVY!!! I wish we had those horse apples in our area, love the pop of color! 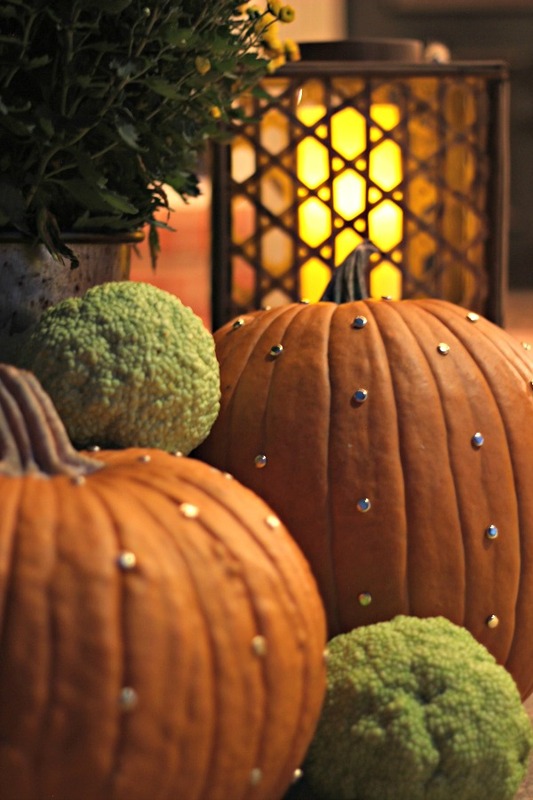 So cool how you "studded" the pumpkins...nice detail. 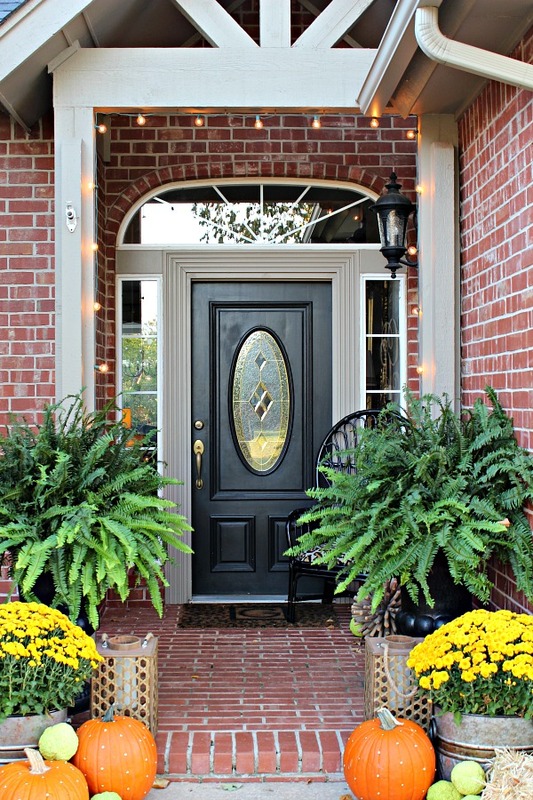 Your guests must feel very festive coming into your home!! Gorgeous! You are so right about the darn lanterns getting dirty so quickly! Love your pics! Jennifer I love the studded pumpkins!!! That is such a fun idea. The lights are great too! !